Mir (Russian: Мир, which can mean both Peace and World) was a Soviet (and later Russian) orbital station. 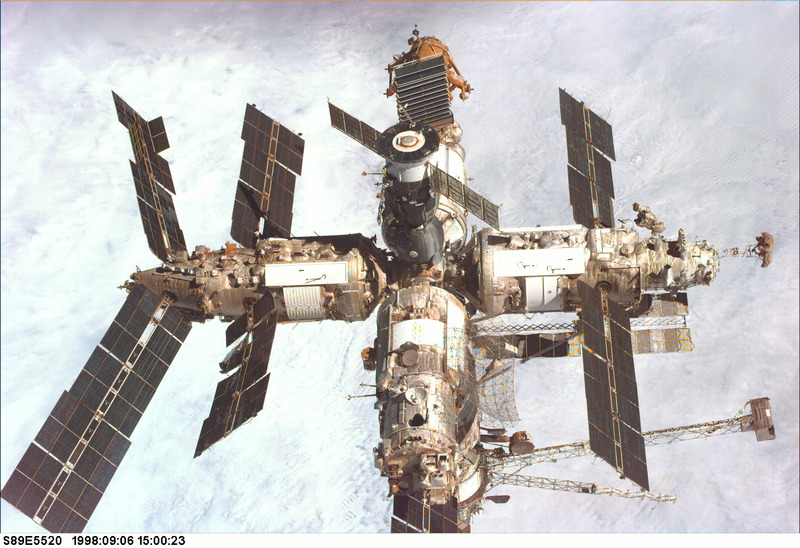 Mir was the world's first consistently inhabited long-term research station in space, and the first 'third generation' type space station, constructed over a number of years with a modular design. Mir holds the record for longest continuous human presence in space at eight days short of 10 years, and, through a number of collaborations, was made internationally accessible to cosmonauts and astronauts of many countries (program Intercosmos). The most notable of these, the Shuttle-Mir Program, saw American Space Shuttles visiting the station eleven times, bringing supplies and providing crew rotation. Mir was assembled in orbit by successively connecting several modules, each launched separately from 1986 to 1996. The station existed until 23 March 2001, when it was deliberately de-orbited, breaking apart during atmospheric re-entry over the South Pacific Ocean. The Ryabina experiment began in 1990 onboard MIR station orbiting at altitudes 350-400 km and 52° inclination. The package, purposed for observation of charged particles, is located inside the Kvant-2 module. Detectors of the instrument package allow observing fluxes of >0.1 MeV gamma-quants associated with bremstrahlung emission of high energy electrons of similar energies and with integral fluxes of high energy electrons (>5 MeV) and protons (>60 MeV). The orientation of Ryabina is not fixed, so the average fluxes of charged particles may only be estimated. Data collected from January 1991 to November 1996 is available. The Ryabina instrument package onboard MIR station was created in D.V. Skobeltsin Institute of Nuclear Physics of the Moscow State University (SINP MSU). Ryabina includes two instruments inside the Kvant-2 module (the minimum passive shield is 3 g/cm2): gas-discharge counter GDC (1cm diameter and 7.5 cm length), and scintillating crystal NaI(Tl) (1.6 cm diameter and 3 cm height). The effective geometric factor for detecting of particles is undefined due to unknown geometry of experiment (the mass distribution and instrument orientation are not available). Therefore only relative changes of particle fluxes may be used. *The count rates of the parameters include the high energy particles (e>5 MeV+p>60 MeV). **The thickness of the shield is different in the different direction of view. The SPEKTR module of the MIR orbital station was launched in May 1995. The multipurpose experiment was based on the GRIF-1 research complex consisting of an oriented X-ray spectrometer, a spectrometer of gamma-quanta and neutrons, a spectrometer of electrons and protons with a large geometrical factor, and a spectrometer of electrons, protons, and nuclei with a small geometrical factor. The solar geophysical aspects of the experiment included the measurements of spectral and temporal parameters of solar hard electromagnetic (0.01–50 MeV) and neutron (>20 MB) radiation, the study of spectral, temporal, and spatial characteristics of energetic electrons (0.04–1.5 MeV), protons, and nuclei (1–200 MeV/nucleon) in the circumterrestrial space, as well as the correlations of these parameters with solar activity phenomena.